Welcome back, Andrew! 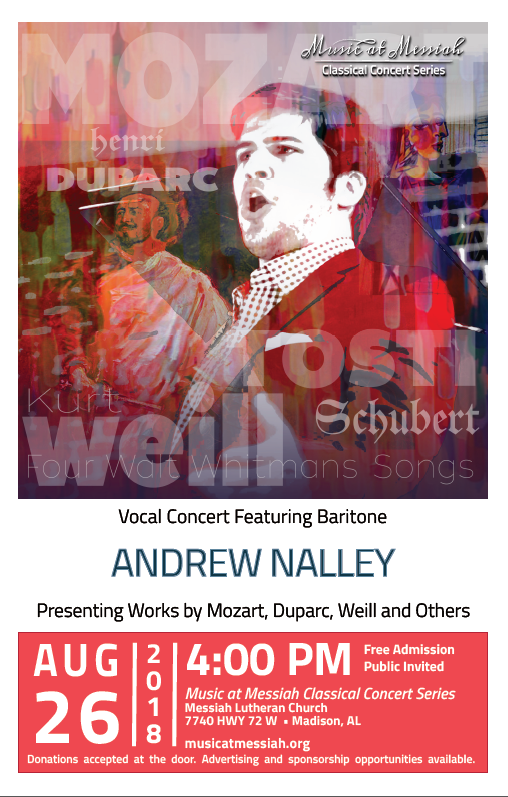 Baritone Andrew Nalley, a Huntsville native, recently completed his Master of Music degree in Voice Performance and Pedagogy at the University of Houston. While there, he appeared in L’italiana in Algeri, The School for Scandal, The Love for Three Oranges, Il matrimonio segreto, The Crucible, and Roméo et Juliette. He has played other leading roles in The Cunning Little Vixen, Don Giovanni, A Little Night Music, The Consul, La Cenerentola and Così fan tutte. Nalley has been a winner and a finalist in competitions including Alabama’s MTNA Young Artist Voice Competition, the Alabama Federation of Music Clubs, and the Alabama Music Teachers Association. This summer concert of the Music at Messiah Classical Concert Series will be held on Sunday, August 26 at 4 p.m.
Our sponsors make this series possible. Please consider becoming a sponsor of Music at Messiah. For more information, visit www.musicatmessiah.org or stop by the Welcome Center.